TapCibo which started its operation in October 2014 has renamed itself as â€˜Dazoâ€™ in April. Read more what the Co-founders shared in a telephonic conversation with Restaurant India. 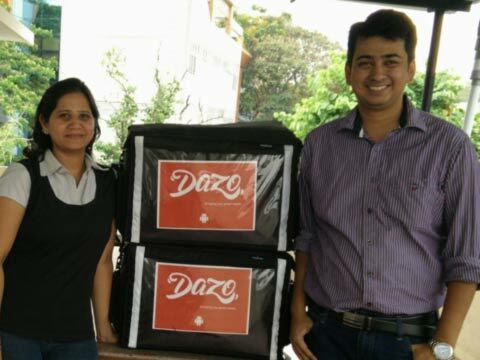 Operated by techie Monica Rastogi and Shashaank Singhal Shekhar, who are both Red Bus ex-employees, Dazo has become a new and integrated food solution for people who have an appetite for fresh and healthy food. Presently, doing close to 300-350 orders on a daily basis, the food market place is planning to expand its services across Bengaluru and in other cities soon. How was the idea of ‘TapCibo’ born? Monica: When I returned to Bengaluru in 2012 after spending time in the US, I found that the city’s busy working population consumed mostly unhealthy food. Either they were having ‘rich’ food or expensive salads (or worse, skipping lunch altogether). And they couldn’t find enough places that could suit their tastes and could be counted as healthy. And hence, to bridge the gap, I decided to start this together with my colleague Shashaank, who was also facing the same problem. Shashaank: My colleague and me were working with Red Bus, and finding the same problem in getting the right quality food. Being from a technology background, we thought of doing something in food along with technology and nothing looked best for us other than venturing into the food delivery service, where we could deliver food conveniently to customers. As you both are a ‘Techie’, how are you ensuring service through food app? Monica: From the day of the operation, we focused on the convenience of our customers, and hence, we started our food app. Once a customer downloads the app, they get an option for food listed on our site. And the customers can have a choice of vegetarian and non-vegetarian meals including salads. Once the customer selects the meal option and the quantity he is taken to the next screen which shows their current location or the location where the order has to be delivered. After selecting the location, the customer is taken to checkout screen wherein they need to fill the exact address, if need be, and your contact details and confirm (the third tap). And the food is delivered to them within 2-3 hours. Meanwhile, we have also included technology in our next order, wherein if a customer comes back to us next time by using the app, they won’t need to re-confirm the details on the third screen. What is the operation process? Who are some of your restaurant partners? Shashaank: When we receive an order from our customers, the meals are already discussed with our restaurant partners, when the order is made; our delivery boy reaches the restaurant and delivers it to the customer. We have Tadka Singh, The ants cafe, Chai Point, Bhukkad and the Kitchen of Joy amongst others. From where did you get the initial investment? You also received funding recently, where can we see that money being invested in? Shashaank: The initial investment was done by both of us. However, I wouldn’t like to disclose the amount. And in my recent seed funding, which I did last month, we would focus on building technology, what does the customer want and how would we leverage technology into the same. We would also focus on bringing young talent and also expand our services. Shashaank: We launched our services in Koramangala and Bagmane Tech Park last month reaching out to potential customers. We have launched a wallet through which customers can make the entire transaction cashless. Lunch, dinner and evening snack options are changed on a daily basis and include a wide variety of cuisines. There is a significant integration of technology at the backend to automate and optimise the logistics of food delivery. And for the next two-three months, we will focus on Bengaluru by launching in new areas. And after a few months, we will enter into markets like Pune, Delhi, Mumbai, Hyderabad and Chennai. Why did you rebrand yourself as Dazo from ‘TapCibo’? Monica: We wanted a catchy and small name and as Dazo comes from the foodies, it was a much easier name to pronounce and relates better as compared to TapCibo, so we thought of re branding it.